As a conversion rate optimization professional, you’ve no doubt tried dozens of tools to help make your work easier. Whether it’s simplifying analytics data or simply improving collaboration, we’ve collected five of the best tools to help you do your job better. And keep in mind, this isn’t the same old resource list you’ve seen hundreds of times before. If you’re into CRO, you already know about Google Analytics, so let’s skip the basic stuff and get down to getting more done! If you are in charge of list management and need to juggle multiple tasks and assignments — separating what’s urgent from what’s not based on metrics, responding to requests from other project managers or departments, and perhaps worst of all, having to look at the monster that is your ever-growing to-do list — then you should consider Comindware Project for marketing teams. Comindware Project is a simple and intuitive project management and collaboration software. 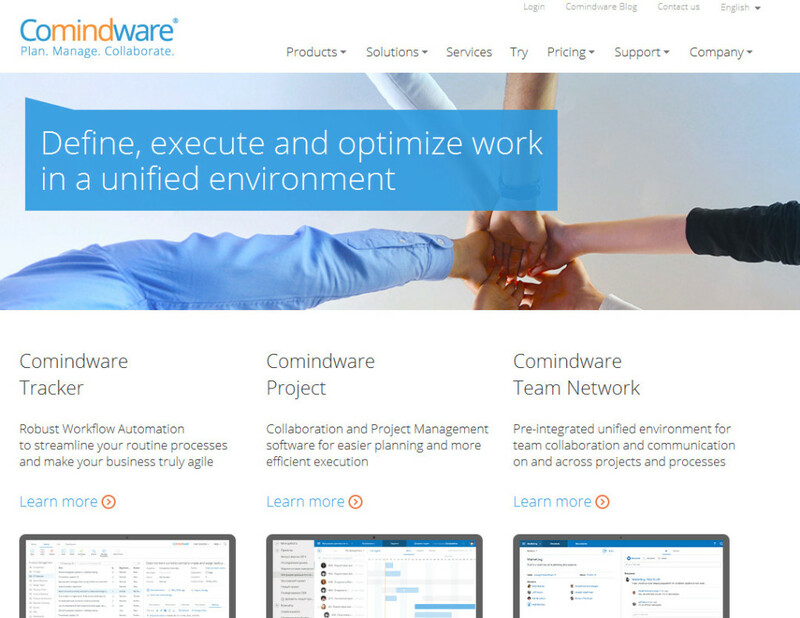 Built on top of Comindware Team Network, the industry’s first pre-integrated social collaboration platform, Comindware Project provides a unified workspace for marketing project managers and their teams, enabling seamless data and document sharing as well as the real-time view on project priorities, resource availability and task completion progress. Comindware offers a 30-day free trial with pricing as low as $29.99/month. Special Deal for Our Readers! In partnership with Comindware, Crazy Egg is providing 4 months free on Comindware Project. Sign up for an annual subscription of Comindware Project by the end of March 2015 and enjoy the next 365 days of better productivity! To claim your discount, use the coupon code “S82-PD1-AST” in your shopping cart. Looking for hands-on experience with Comindware Project? Follow the link to activate a free 30-day trial of Comindware Project. Studies have shown that most visitors only stay on your pages for a few seconds. But have you ever wondered what kind of impression your site leaves with them? Did they leave because it was difficult to navigate? Did they not find what they were looking for, or were there too many calls to action? With Five Second Test, you can find out answers to all these questions and much more. You simply upload your screenshots or mockups to start the process. Users get five seconds to view your image and are then asked a series of questions (which you can customize). The responses are collected and charts are generated for you automatically, so you can get meaningful results from the test quickly. You can see a sample report to learn what’s included. Five Second Test is free to sign up, and you can invite your own testers for free. If you want to use testers available from Five Second Test, however, the cost is $1 per response. A pro account is also available for $99/month which gives you further customization options and the ability to select the demographics of your testers. Let’s say you’ve had Google Analytics installed for quite some time. But you’ve only recently made use of the conversion goals and funnels feature. Don’t you wish there were a way to go back retroactively and see how well your offers performed in the past? Or better yet, to have recent results delivered to you in a beautiful format that’s easy to understand and act on? That’s what PadiTrack is all about. With PadiTrack, you can have unlimited funnel lengths with varying mandatory and optional steps, so you’re only getting the information you really need to be able to make confident decisions. 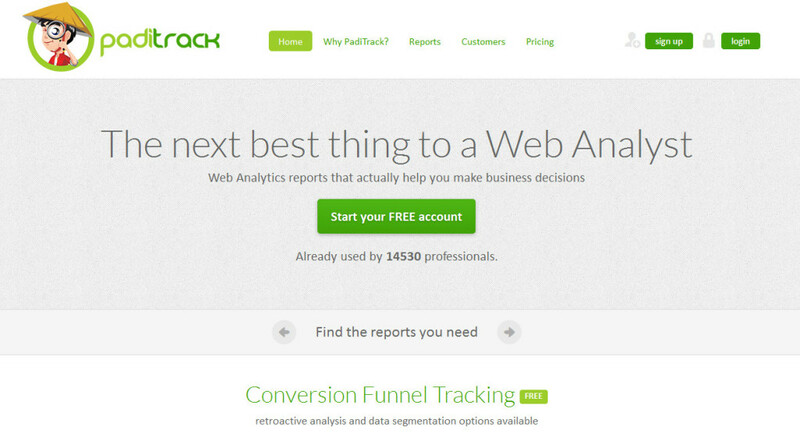 PadiTrack is free for conversion funnel analysis, but a Pro account ($29/month) will also let you analyze and get reports on your landing pages, e-commerce performance, and micro-conversions achieved along the way. The Pro account also lets you export your data and allows an unlimited number of profiles in your Google Analytics account to be used with PadiTrack. Formisimo can give you details and insights on these problems and much more. Whereas most analytics packages concentrate on the big picture, Formisimo is only concerned about forms and checkout processes. Learn how long it takes people to complete fields, what fields were corrected most often, and what areas people typically drop off on before submitting the form. Formisimo has a 14-day free trial, along with a free plan that lets you use 1 domain and gather data for 1,000 visitors per month. Small business plans start at $59/month. Sticky notes in your browser — what’s not to love? 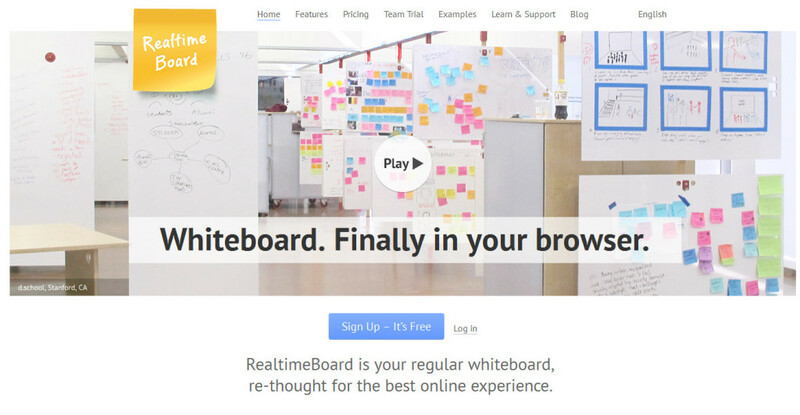 As its name implies, RealTimeBoard brings the collaborative and communicative facilities of mind maps, sticky notes and storyboards to the browser. What’s more, it’s fully compatible with Google Drive, so you can add PDFs and documents directly from the cloud. You can also import pictures and videos (Youtube and Vimeo) to create a rich media experience. And if you love the idea of using technology but still miss your stick notes and highlighters, you can have the best of both worlds with RealTimeBoard. A free account limits the number of boards you can have, whereas the paid accounts (Premium and Team) offer capabilities like screen sharing, increased storage space, video/voice chat and manual backup functions. With a paid account, you can also limit access rights, so confidential brainstorming sessions stay confidential. RealTimeBoard is free for up to 3 boards and 100 MB of space. A Team account starts at $8/user/month (billed annually) or $10/user/month when billed month to month. A premium account is the same price but is geared toward personal projects. Educational licenses are also available. While it can be exciting to try all these resources and shave hours (if not days) off of your conversion-related tasks, don’t forget that these are still just tools. All that information you’ve been collecting still needs to be analyzed and transformed into meaningful changes that will make an impact on your target audience. In other words, don’t get so bogged down in the feature list that you forget the purpose of these tools – maximizing your productivity! That being said, there’s no doubt that new services and apps are changing the way conversion optimization professionals work. What are some of your favorite tools and productivity products? Share them in the comments below and tell us what makes them great!